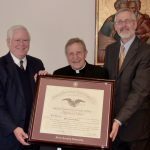 On January 11, 2011, in the Vatican, Institute director Philip A. Cunningham and College of Arts & Sciences Dean William Madges presented Cardinal Walter Kasper with an honorary doctoral degree in Sacred Theology from Saint Joseph’s University. The citation praised Cardinal Kasper “for your dedication to the vision of a new relationship between Catholics and Jews set forth by the Second Vatican Council, for your labors to begin to achieve that vision as President of the Commission for Religious Relations with the Jews, and for your exemplary modeling of the work of a Catholic theologian in service to the Church and to interreligious understanding.” The text of the citation that was also presented to Cardinal Kasper and his reply follow. For a collection of Cardinal Kasper’s important writings on Catholic-Jewish Relations, click HERE. Saint Joseph’s University is pleased to bestow its highest honor upon His Eminence, Cardinal Walter Kasper, for his exemplary work as a bishop-theologian who has promoted ecumenism among Christians and strengthened the relationship between the Catholic Church and the Jewish people. Saint Joseph’s University commends Your Eminence as a theologian. For decades you have been a leading theologian and professor. Your important 1976 book, published in English as Jesus the Christ, remains a standard christological text. As professor of dogmatic theology and dean of the theological faculty in Münster and later in Tübingen, you influenced generations of students of theology. When appointed bishop of Rottenburg-Stuttgart by Pope John Paul II in 1987, you brought deep theological learning to the Episcopal ministry and served as an outstanding model of the bishop-theologian. Saint Joseph’s University commends Your Eminence as an ecumenist. For decades you have promoted ecumenism among Christians. In addition to writing significant scholarly essays in the field, you were chosen in 1979 as one of a dozen Catholic theologians to sit on the World Council of Churches’ Faith and Order Commission. In 1994 you were named co-chair of the Lutheran-Catholic Commission of Unity. In that capacity you oversaw the development of the historic 1999 Lutheran-Catholic “Joint Declaration on the Doctrine of Justification.” In recognition of your contributions, Pope John Paul II selected you in 2001 to be the new president of the Pontifical Council for Promoting Christian Unity and elevated you to the College of Cardinals. Saint Joseph’s University especially wishes to commend Your Eminence as a bridge-builder between the Catholic and Jewish faith communities. Finally, your dedication to pursuing these challenging topics has prompted you to support relevant sustained academic research. One example of this has been your consistent encouragement of the work of a transatlantic team of scholars, culminating in the important foreword you have authored for their forthcoming book, Christ Jesus and the Jewish People Today: New Explorations of Theological Interrelationships. Your support has been edifying for everyone involved. For all these reasons, for your dedication to the vision of a new relationship between Catholics and Jews set forth by the Second Vatican Council, for your labors to begin to achieve that vision as President of the Commission for Religious Relations with the Jews, and for your exemplary modeling of the work of a Catholic theologian in service to the Church and to interreligious friendship, Saint Joseph’s University is proud to confer upon you the degree of Doctor of Sacred Theology honoris causa. I am very honored to receive this doctorate and I want to express my deep gratitude to the University and its President, to the Faculty and to you. Saint Joseph’s University is one of the oldest and most prestigious Jesuit universities and highly esteemed in the academic world. I thank you personally. For you came here to Rome particularly for this occasion. In my German language we have the slogan: If the prophet does not come to the mountain, the mountain comes to the prophet. Now, I am no prophet at all, but a simple cardinal and a simple theologian. This means a man, who has to do theologia, talk about God, and to do this giving account of his faith and his hope and doing this in love and with respect for everybody’s person and conviction. This is since more than 20 years my motto as a bishop: “Veritatem in caritate,” which corresponds well to Philadelphia, brotherly love. To spread Philadelphia, brotherly love, among the divided churches and between the Jewish people and the Catholic Church as well, this was my duty in the last years. It was also my honor to serve in this field of reconciliation and peace and to make the Church more a sign and a lighthouse for peace in a world which, though all globalization, is divided and lacerated in many ways. What I could do, before I was allowed to return to my own craftsmanship, the theology, is only a small contribution to this great work. Others will follow; they are gathered here. That you acknowledged what I could do, honors me and gives me satisfaction. Thank you again and give my greetings and the expression of my gratitude to the President of Saint Joseph’s University, Fr. Lannon, and the whole faculty. Thank you and let us now raise the glass to honor Saint Joseph’s University.